The contents of our pages will remain "under construction". As Items come in and are tested and reviewed, they will be added. This will be a work in progress. I have much to say. Wink I must tell you, after 30 days I would recommend this type Aussie Saddle to anyone. I would highly recommend this saddle to anyone with knee or back problems. 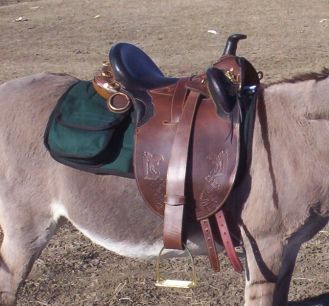 This is a comfortable saddle that does not over work your knees and legs. You can ride further and have a better time in this new saddle then in a type with heavy, thick, wide fenders...and this saddle's fenders, correctly called leathers, are as safe and well built as any a person riding in any saddle would need. The stirrups that came with the saddle, Brass 4 Bar Stirrups STIR 328, at 5" wide, are wide enough for any boot my husband and I might ride in, heavy enough to be safe, and the polished brass is beautiful. Adjusting the stirrups is an easy task, unlike some saddles I have worked with. Correctly adjusted stirrups equals a safer ride, so for me, this is an important feature.